We have cruised with many cruise lines over the years and last year we had the wonderful pleasure of cruising on the Celebrity Eclipse and we loved it. The ship, the food, in fact everything was perfect so we booked an Aqua Class cabin Christmas Caribbean this year without hesitation on the sister ship &apos;Refelection&apos;. Embarkation was busy, however you expect that on a big ship. We stayed with friends in Miami prior to joinung the ship so we were ready and excited for our cruise. The ship was very similar BUT we feel that Celebrity seem to be cutting back so much it was like chalk and cheese. How could 2 cruises be so different? For us we loved the sail always on the Eclipse, picture the scene ........ sat on real grass on lawn club seats being served wine and cheese with a lovely duo playing in the background. Pure class which made Celebrity a cut above the rest and that happened 3 times during our cruise. This cruise it did not happen, when I asked why? I was told that the weather in the Caribbean was to unpredictable for this to happen, HOWEVER they were happy to offer an outside BBQ with the officers for $100 per person. What happened to the unpredictable weather? There was a saying that I learnt from the passengers on this cruise &apos;Nickles and Dimes&apos; which means that Celebrity are cost cutting that much it so apparent it&apos;s scary. The lack of fish and seafood: This is another &apos;Nickles and Dimes&apos;! The buffet in the Eclipse offered a wonderful selection of fish and seafood, however this was not the case on the Reflection. After day 3 of one fish choice on the lunch menu I asked to see the Head Chef. He said that he would offer another selection but due to his orders from head office he was not able to offer seafood. IN THE MIDDLE OF THE SEA AND NO SEAFOOD? REALLY? He stated and I quote: the demographic on Caribbean cruises was different to European cruises, I then said so what your saying is that Americans prefer burgers and meat rather than fish and seafood and he just smiled at me. Thing is that we may be British but we have many American friends who love fish and seafood as much as the Europeans so that is complete rubbish Chef!! We are not massive meat eaters so fish and seafood is an important part of our diet snd that&apos;s one of the many reasons we love cruising... The cabin was lovely as expected but the points we have written about let us down. The staff were friendly but seemed overworked on this ship. The Entertainment was hit and miss but it lacked something that other ships has to offer. If your looking for class and seafood forget the Celebrity Reflection....... We have! Never ever again. Shame on you Celebrity!!! 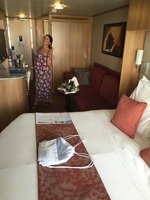 We have cruised with many cruise lines over the years and last year we had the wonderful pleasure of cruising on the Celebrity Eclipse and we loved it. The ship, the food, in fact everything was perfect so we booked an Aqua Class cabin Christmas Caribbean this year without hesitation on the sister ship &apos;Refelection&apos;. Embarkation was busy, however you expect that on a big ship. We stayed with friends in Miami prior to joinung the ship so we were ready and excited for our cruise. The ship was very similar BUT we feel that Celebrity seem to be cutting back so much it was like chalk and cheese. How could 2 cruises be so different? For us we loved the sail always on the Eclipse, picture the scene ........ sat on real grass on lawn club seats being served wine and cheese with a lovely duo playing in the background. Pure class which made Celebrity a cut above the rest and that happened 3 times during our cruise. This cruise it did not happen, when I asked why? I was told that the weather in the Caribbean was to unpredictable for this to happen, HOWEVER they were happy to offer an outside BBQ with the officers for $100 per person. What happened to the unpredictable weather? There was a saying that I learnt from the passengers on this cruise &apos;Nickles and Dimes&apos; which means that Celebrity are cost cutting that much it so apparent it&apos;s scary. The lack of fish and seafood: This is another &apos;Nickles and Dimes&apos;! The buffet in the Eclipse offered a wonderful selection of fish and seafood, however this was not the case on the Reflection. After day 3 of one fish choice on the lunch menu I asked to see the Head Chef. He said that he would offer another selection but due to his orders from head office he was not able to offer seafood. IN THE MIDDLE OF THE SEA AND NO SEAFOOD? REALLY? He stated and I quote: the demographic on Caribbean cruises was different to European cruises, I then said so what your saying is that Americans prefer burgers and meat rather than fish and seafood and he just smiled at me. The cabin was lovely as expected but the points we have written about let us down. The staff were friendly but seemed overworked on this ship. The Entertainment was hit and miss but it lacked something that other ships has to offer. If your looking for class and seafood forget the Celebrity Reflection....... We have! Never ever again. Shame on you Celebrity!!! Nice cabin with good storage space but the other points of the cruise let us down.